Part Used & Method for Pharmaceutical Preparations: The tuberous roots are dug in autumn. After the fibrous roots have been removed, the roots are boiled in hot water or steamed, and soaked again in clear water. The roots are then dried in the sun or baked. Finally, they are cut into slices. Properties & Taste: Sweet, bitter and very cold. 1. 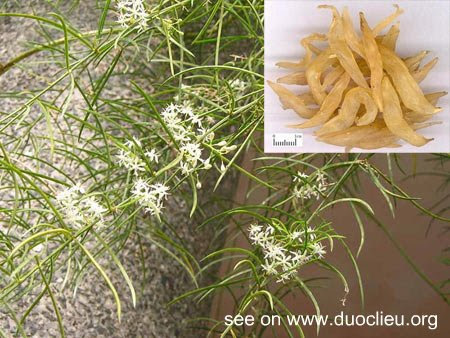 Flaring up of fire caused by deficient yin of the lungs and kidneys manifested as scanty and sticky sputum or cough with bloody sputum: Asparagus root (Tianmendong) is used with Ophiopogon root (Maidong) in the formula Erdong Gao. 2. Consumption of yin and qi by febrile disease manifested as thirst, shortness of breath or diabetes: Asparagus root (Tianmendong) is used with Fresh rehmannia root (Shengdihuang) and Ginseng (Renshen) in the formula Sancai Tang. 3. Constipation due to dryness in the intestines: Asparagus root (Tianmendong) is used with Chinese angelica root (Danggui) and Cistanche (Roucongrong).